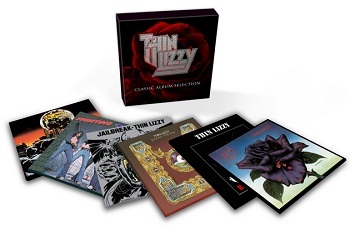 Universal have just released a Thin Lizzy collection (I'm sure some of you are already thinking "not another one"), but this isnt a greatest hits collection - this is the bands six albums released between 1974 and 1979 packaged together in one collection - and at a very reasonable price. So for around £17 or so, you get six albums - thats 57 songs and approaching 4 hours of music - a bargain really when a single new album will cost £10-15. The collection contains six great albums that allow you to not only hear the hits, but to also see how their sound changed during this time. The lineup was constant for five of these albums: Phil Lynott - Vocals/Bass, Brian Downey - Drums, Scott Gorham - Guitars, Brian Robertson - Guitars. For the last of these albums (Black Rose), Brian Robertson was replaced by Gary Moore. As you can see from the track listings below, all the albums have at least one "hit", but the rest of the songs are more than worthy of attention. I've listened to the whole set several times now and although one or two songs feel a little dated, overall the vast majority are really top quality songs, and there's a lot more diversity here than is reflected in the hit singles. The songwriting really is amazing - these albums have produced so many great songs that have stood the test of time that many bands have tried and failed to emulate them. This is an excellent collection at a bargain price. It's easily found for less than £18 online (Amazon, Play.com etc), so thats under three quid per album for six classic albums by one of the greatest rock bands of all time. A lot of people probably have a Thin Lizzy compilation album but that only gives you the best known songs whereas this collection will give you not only the classic hits, but also the lesser known gems. A must have album collection for any serious rock fan that doesnt already own these albums.